Dietary supplements are consumed in large quantities, and are often referred to as vitamins, minerals or even botanicals derived from plants. A dietary supplement is intended to provide nutrients that may otherwise not be consumed in sufficient quantities. Black pepper, a common spice, is also regarded as a dietary supplement and a source of piperine. Usually when an analytical method is developed, the sample is the focal point of the analysis, driving the consumables or accessories needed, and the optimum sample preparation method to analyze the sample and produce reliable results. In other words, decisions are dictated by the sample. In pharmaceutical control, the methodology is regulated by different pharmacopeial bodies, such as the United States, British, European, Chinese and Japanese Pharmacopeias, who establish and update official monograph methods. With a regulated method, one must follow the monograph instead of just putting the sample at the center of the decision making, so it is purely following the instructions in the monograph. One must know how to apply the dictated product specifications in the methods to get to the point where the value of interest can be reported. There is clearly defined information on what can be changed, the system suitability criteria to meet and how the method should be validated. In an article written by Anita Piper, Markus Burholt, Stephan Altmaier, Michael Schulz and Patrik Appelblad, powdered black pepper was chosen as an example, and it has been tested according to the current United States Pharmacopeia (USP) guidelines. Testing dietary supplement products using regulated chromatographic methods requires an understanding of how different products can be used and operated based on the guidelines of the monograph. 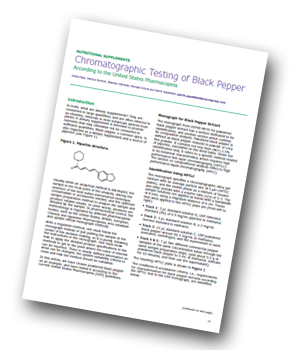 This article will demonstrate that by using suitable HPTLC and HPLC media, appropriate filter, high purity solvents and reagents and following the prescribed USP monograph recipe, you can easily meet the system suitability criteria for black pepper.